Influenza has been unseasonably hyperactive during Australia’s hotter and wetter months at the end of 2018 and the start of 2019. In what’s shaping up to be our biggest summer of influenza. Australia has seen more than twice the usual number of cases. This abnormally high number of confirmed flu infections has been occurring during November and December. We have 806 cases so far in January but no idea of the rate of new cases. While a 2-fold increase is hardly setting the house on fire, it’s unusual and it would be nice to know what’s driving it. Confirmed Flu infections across Australia. Most Australian States stopped their weekly/fortnightly Flu season reporting months ago with only Queensland reporting into December. National numbers are still being added but there are no virology details. This means finding out which types and subtypes are circulating right now is difficult for the public. 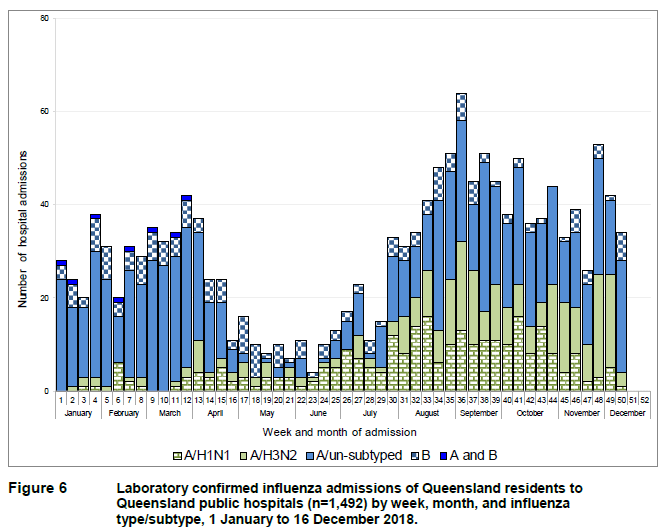 From the last Queensland report, which included data up to 16th December , the dominating Flu subtype for some weeks, in those which had been subtyped, had been FluA H3N2. A/H3N2 replaced A/H1N1 earlier in the year, perhaps bringing with it a significant change in the main circulating virus or viruses. 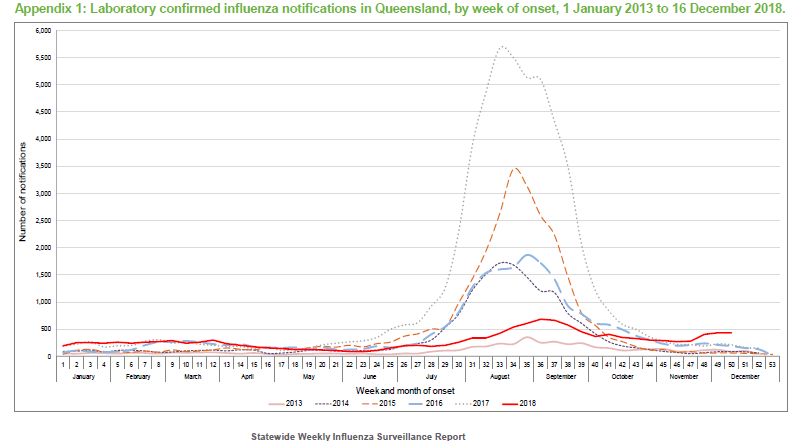 Flu occurring this late in Australia is not the norm (see the first graph). Our Queensland and national 2018 winter Flu season was very small and vaccination levels were reportedly very high. This follows on from the biggest Flu season we’ve ever recorded in 2017. But those facts alone don’t explain the late spike in new cases. As far as we know, we haven’t had a dramatic rise in the number of Flu-carrying tourists travelling Down Under from any particular regions. We know that A/H1N1 is the dominant Flu virus in North America, Central and Eastern Asia. Southern Asia is seeing rising numbers of A/H3N2 and both FluAs are present in Europe. But, again, the November/December Australian level of cases is more than just a bit unusual. This level hasn’t been recorded at such high levels during this time of the year ever before. There is more and better testing in Australia. Traditional and rapid molecular testing have settled in over recent years and there is a little whole-genome sequencing (we need more) . Still, it’s unclear whether tetsing has driven the increased cases seen over the summer period of 2018/19 compared to previous years. I’d guess that it hasn’t unless someone’s budget got a big Christmas bonus to do more testing! Each year, better laboratory testing gives us a much clearer idea of how many illnesses are due to these viruses. Despite this, we still record just a fraction of the infections out there. Why? Because many don’t result in illness we consider serious enough for a doctor’s visit. At the other end of the spectrum though, influenza kills. I’m not sure if the particular extreme climatic conditions could drive this in 2018/19 compared to previous years. Could they enhance the emergence of new strains from the tropics perhaps? I’m left to guess (again) that this high level of summer Flu cases is probably due to one (or more) slightly drifted Flu strains. These may have come in through travel or emerged somewhere within Australia. It will be interesting to see what these current Flu strains are. Those at the coalface will hopefully report that detail in the literature or through the media. It will also be very interesting to see how long this raised level of cases continues and what impact it has on our upcoming winter Flu season. The southern hemisphere’s Flu vaccine formulation for the 2019 season is already locked in , so hopefully whatever Flu viruses are around now, and persisting into the winter, won’t have drifted too far from the protection this year’s vaccines can provide. I’ll be getting that vaccine anyway! Thanks to Dr Katherine Arden for editing contributions. Next → Next post: What’s up d̵a̵n̵g̵e̵r̵ Flu?